Hi everybody! 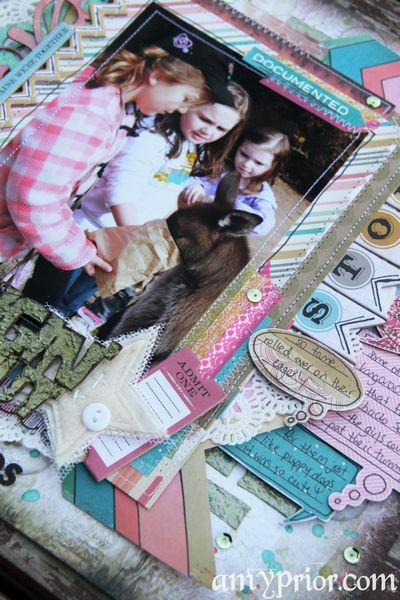 I am back today to share the awesome new challenge over at the A2Z Scraplets blog this month. Caz has chosen a fabulous PageMaps Sketch for us to play along with this month and I um strayed a lot from the sketch in the end because I printed my photo too big and other reasons totally beyond my control but you can still sort of squint and see the original sketch inspiration in my layout LOL. I also decided to tie in with the current CSI Challenge Theme and colours so check out that case file at the end of my blog post and all the details for that challenge. 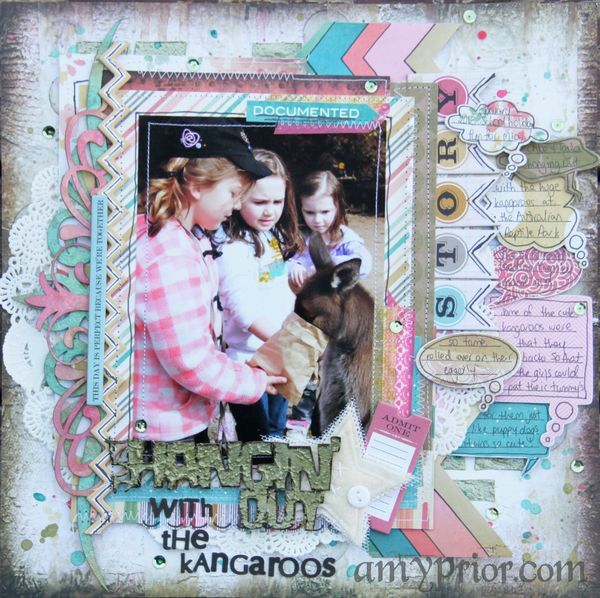 Click here to visit the A2Z Scraplets Blog Post outlining the October Challenge details. Here is my take on the sketch using lots of fabulous A2Z Scraplets products including Brickwall Stencilet, Shapes – Speech Bubbles, Just Hangin Out Title, Doodlet 20 & Doodlet 26. The background paper is from 7 Dots Studio and I have added some Artichoke Shimmerz Texture Paste using the A2Z Brickwall Stencil. I am so in love with these Shimmerz Texture pastes and I definately need to get my hands on some more colours. 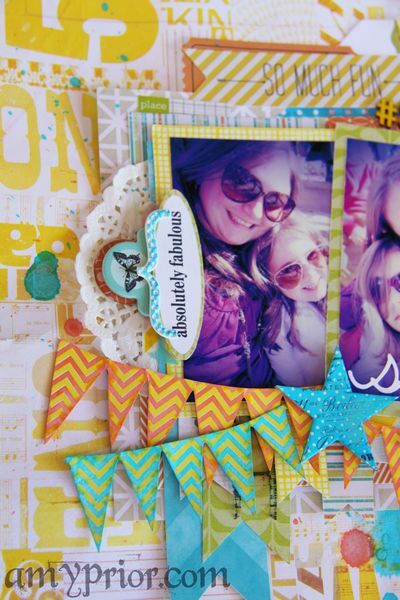 They are so fun and grainy and chunky so they look perfect with the A2Z Scraplets Brickwall Stencilet. I have also splatters some little droplets of Heidi Swapp Color Shine Mists over the background as well to add a touch more colour. My Chipboard title “Just Hangin Out” from A2Z Scraplets has also was covered with the awesome Arti Choked Texture Paste from Shimmerz. I have smeared some of this on my Craft Mat and then dipped the Chipboard title face down into the texture paste. I have then outlined the letters in black permanent texta so you can read it a little easier. The fabulous Doodlets from A2Z Scraplets have been layered on top of each other for a fabulous fun effect but before I have layered them together, I have sprayed them randomly with various Heidi Swapp Color Shine Mists keeping one in cool colours and one in warm colours, Teal, Mustard, Sweet Cherry, Chantreuse & Primrose. Spraying in random spots adds texture without adding texture if you get what I mean? LOL Don’t you love my technical way of describing things? 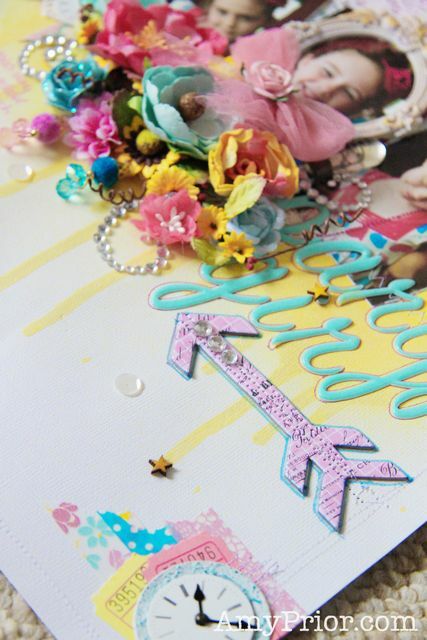 My paper layers are randomly layered pieces varying from Crate Paper, Studio Calico, My Minds Eye & 7 Dots Studio. The only piece of paper that I really put a lot of thought into was the Crate Paper Pier Collection Giant Chevron pattern. 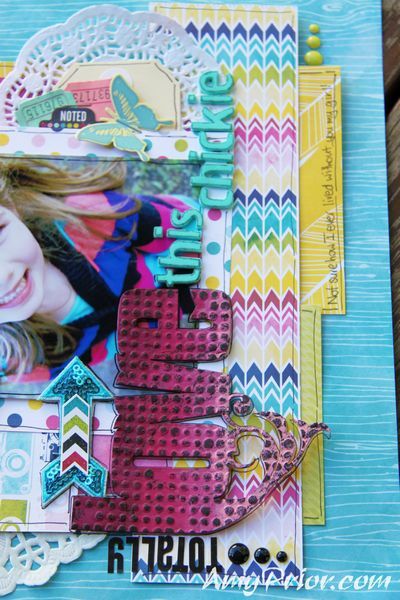 The original patterned paper had various colours including lots of shades of blues, pinks etc and they did not all match with the colour palette from the CSI challenge so I have fussy cut out the pieces of chevron that had the right colours and then stuck them back together to perfectly match my layout. 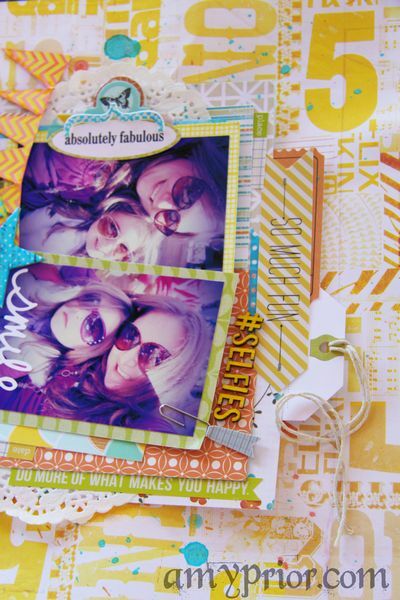 There are lots of fabulous Printed Chipboard pieces on this layout also including some from My Minds Eye & Teresa Collins. 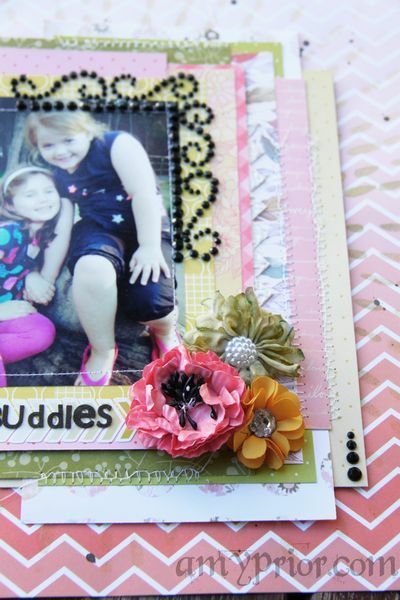 I had lots of fun doodling all over this layout when it was finished and decided at the last minute to add some Clear Epoxy Dots to the background paper as well. 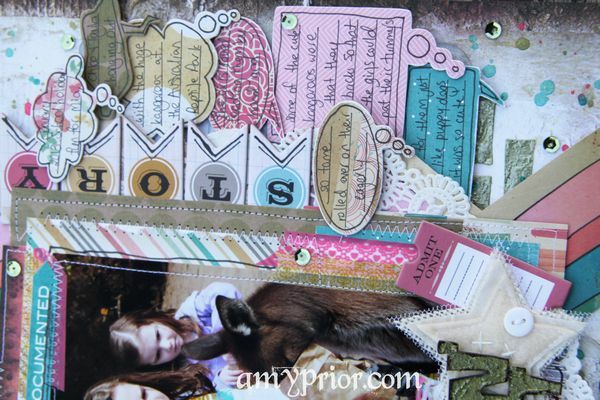 I have used Prima Marketing ones alongside some Tim Holtz Bottle Cap Clear Stickers. 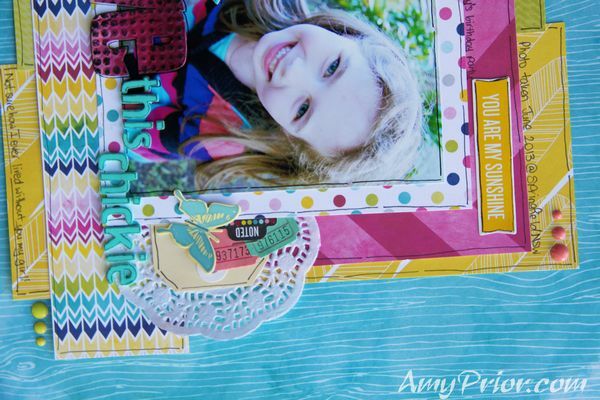 My journalling was written on the A2Z Scraplets Speech Bubbles that have been covered with coordinating papers from my layout. I have then doodled around them and journalled about this awesome day hanging out with the kangaroos at the Reptile Park. The Evidence I have used for the CSI Case File include wet medium, Something Irridescent, Stripes, Speech Bubbles, & flags. Click here to visit the CSI Site and join in the current case file. There are 20 hours left to enter this challenge but 2 new challenges have already been announced including the fabulous prizes up for grabs! Well that is it from me today, until next time, happy scrapping! Hi everyone! 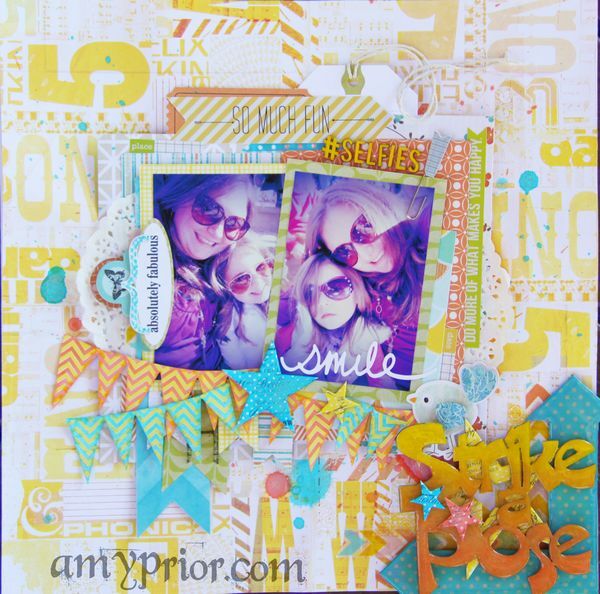 So glad to have you here to share another fabulous layout using the new July Release gorgeous A2Z Scraplets chipboard. Checkout the first release blog post on the A2Z Scraplets Blog here and keep checking back here for more how tos from me. 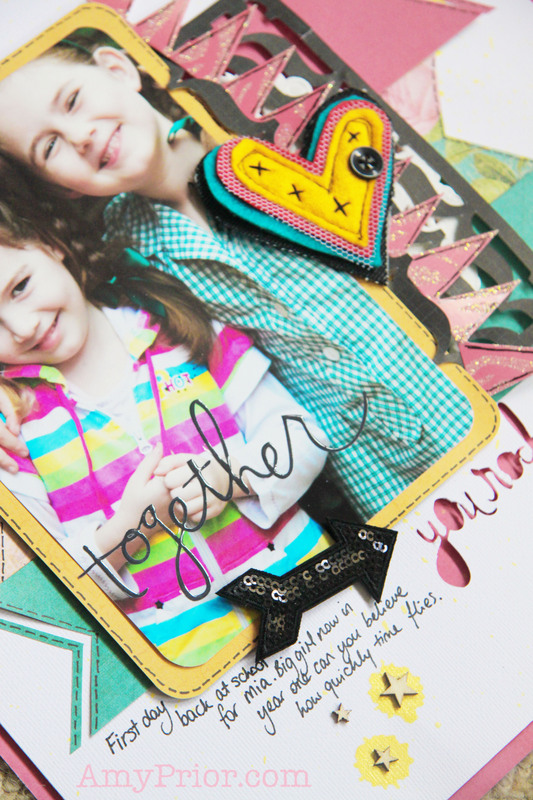 To create this layout, I have used the fabulous papers and stickers from Echo Park Here & Now Collection along side some super cute My Minds Eye Enamel Dots, Heidi Swapp, Studio Calico & Pink Paislee Elements. The awesome chipboard LOVE word was embossed using Tim Holtz Sizzix Embossing Folder and then painted using some Acrylic paints ombre style, followed by some inking with Ranger Black Archival Ink on the raised dots. I just love this title it is so fun and has so many possibilities. Some doodling, layering and thickers added to the title then voila! She was finished and was a super quick layout because of the lack of paint mediums. The chipboard always dried really quickly with water based paints if you are sparing which is awesome. 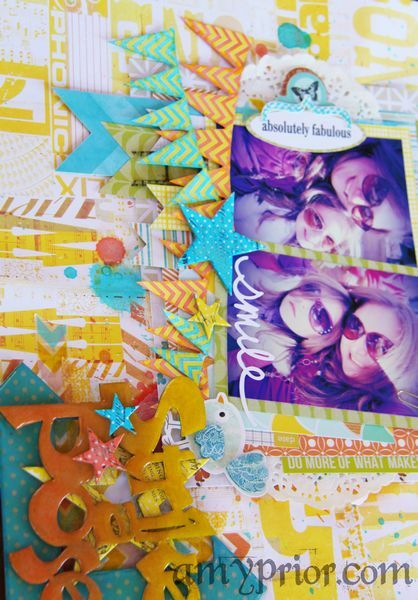 Well that is it from me today, be sure to check back tomorrow for some more A2Z Scraplets July New Releases Inspiration and until next time, happy scrapping! Hi everyone! 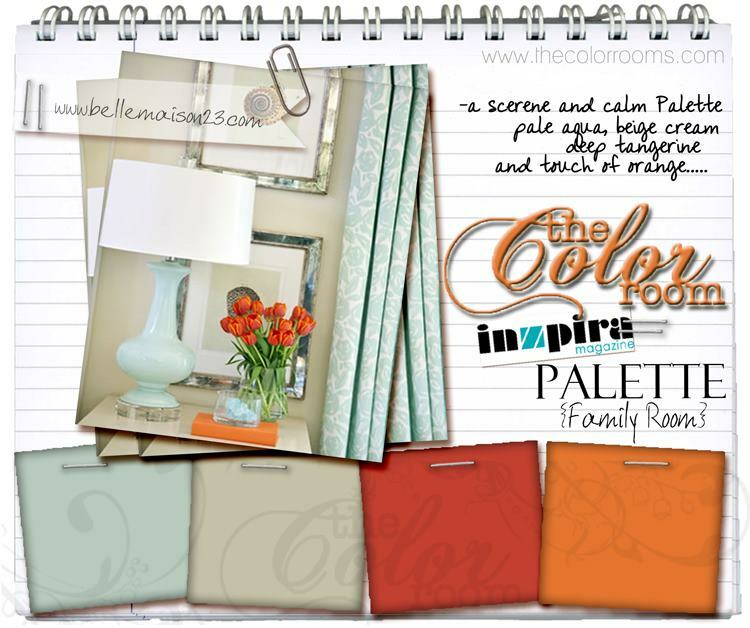 I am back today to share the latest Color Room Palette which is absolutely amazing! Seriously loving this palette of colours and want to play over and over again with this one.. Check out the Color Room website here and the Facebook Page here to join in the fun and get in with a chance to win some fabulous prizes! Here is my take on this amazing palette. I was planning on using the fabulous sketch as inspiration also but alas I got carried away in my own creativity. 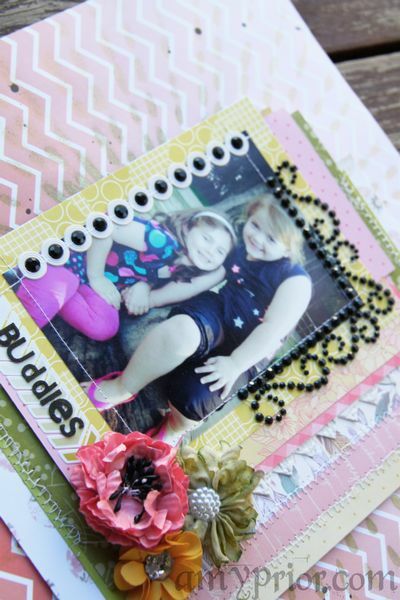 The background White Cardstock has been decorated using some PanPastels and Lindys Stamp Gang Starburst Stain Mists. Next step was to add a doily and my photos. 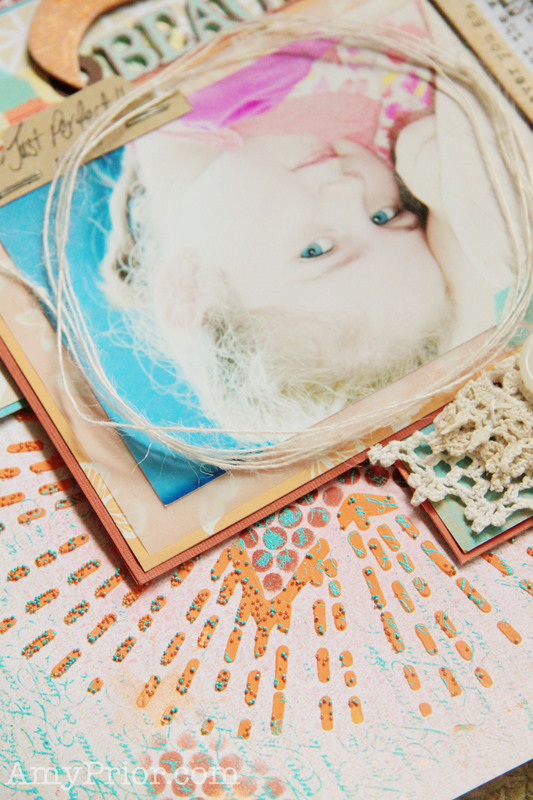 I have distressed the edges of my photos using a nail file and added a super cute Studio Calico Paper Clip, some Washi Tape, Heidi Swapp Buzz Word and an awesome Prima Shabby Resin Frame. 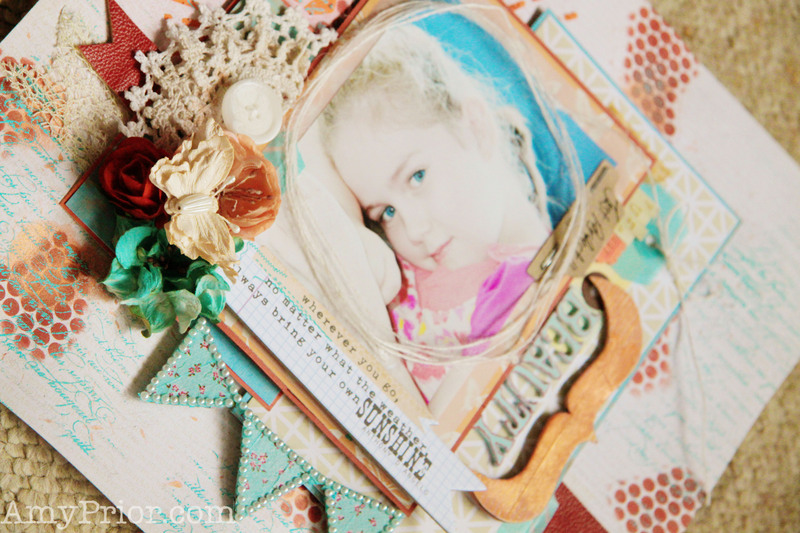 I have added some colour to the frame using Tim Holtz Distress Inks. I then went to town adding some flowers. Yes I usually go overboard but is there such thing as too many flowers? 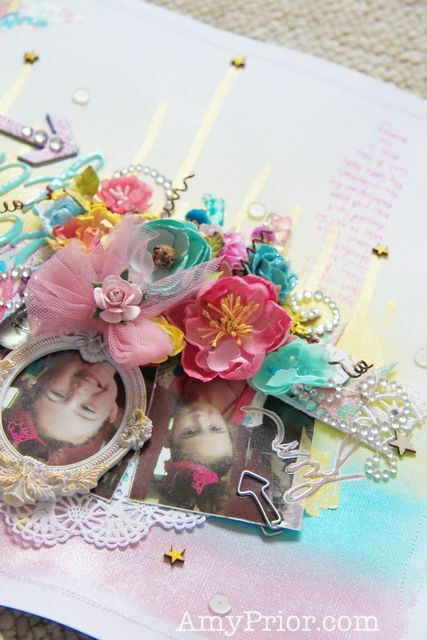 LOL I have also added some yummy Flourish with a Bling flourish pieces around the cluster and to the left, there is some lace and Heidi Swapp Banners poking out from underneath. I then decided to add some Washi Tape, Pink Paislee Artisan Element Circl and a Prima clock to the bottom corner. 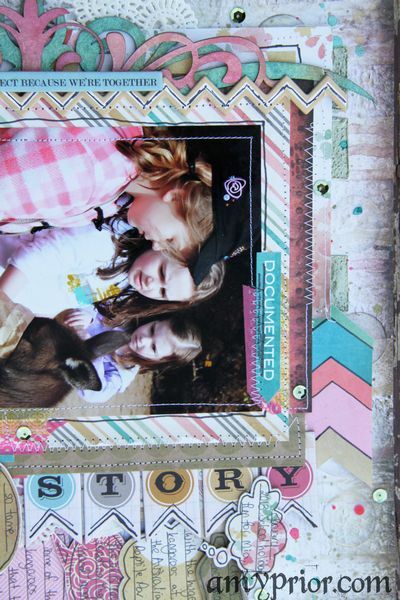 The Pink Paislee Artisan Element was distressed with some Tim Holtz Distress Ink. 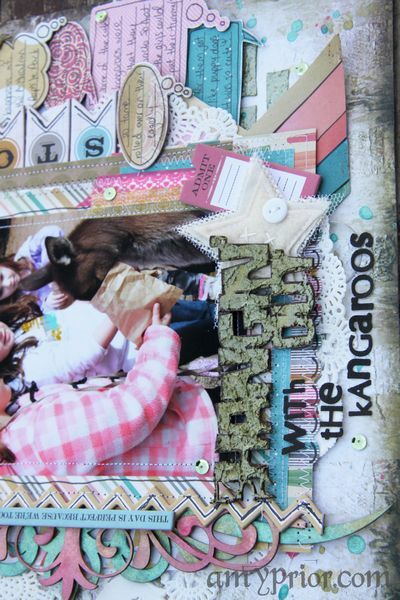 Some added journalling, Prima Baubles, Studio Calico Stars & Sequins and my layout was complete. 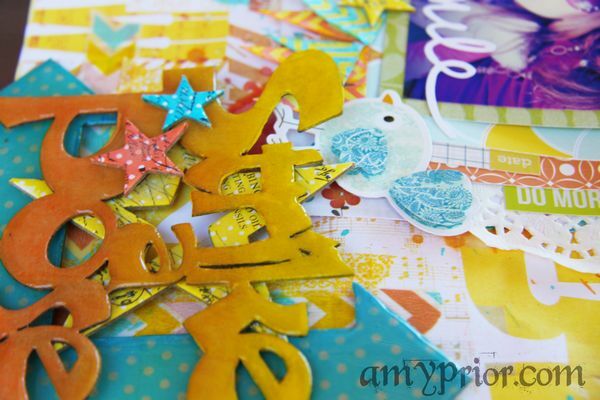 I added some colour to the Wood Veneer stars using some more Tim Holtz Distress Ink. If you are here for my giveaway, click here for more info! Howdy everybody! 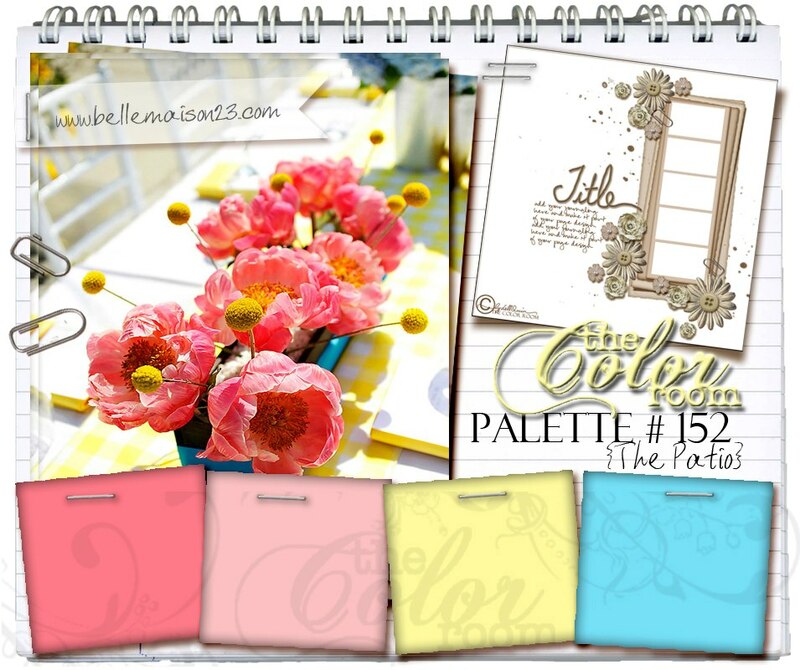 I am so very excited to be sharing this layout with you all today as my first week designing for the Color Room. I am so over the moon, these ladies have been setting the benchmark for amazing designs for so long so I am completely honoured to be included in the team. 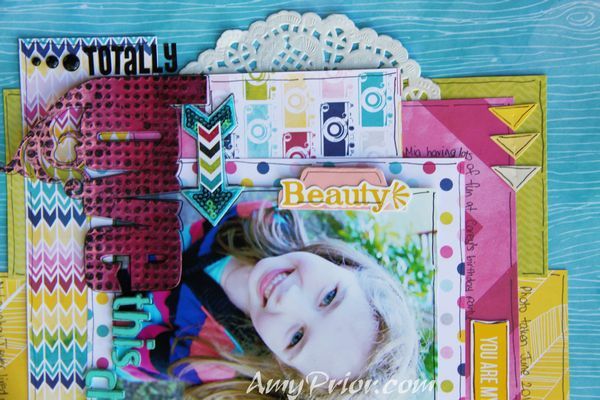 What a fabulous palette for either a boy or girl layout. Click here to view the Color Room Website and click here to visit their Facebook Page and join in the fun. You have until May 24th to get your entries uploaded either using the linky tool on the Color Room Website or by uploading or linking on the Color Room Facebook Page. There are so many amazing prizes up for grabs! Now onto some closeups of course. 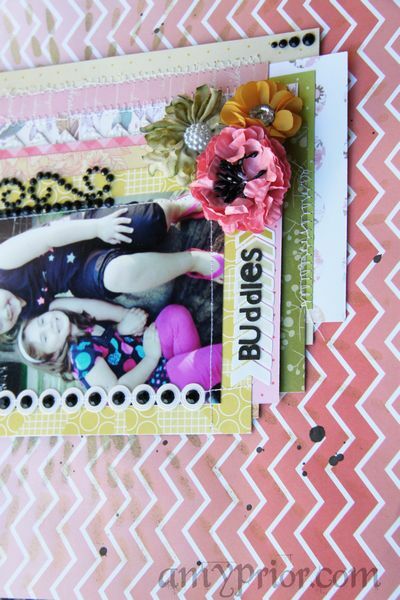 The patterned paper of choice for this layout was a combination of Heidi Swapp and Studio Calico. 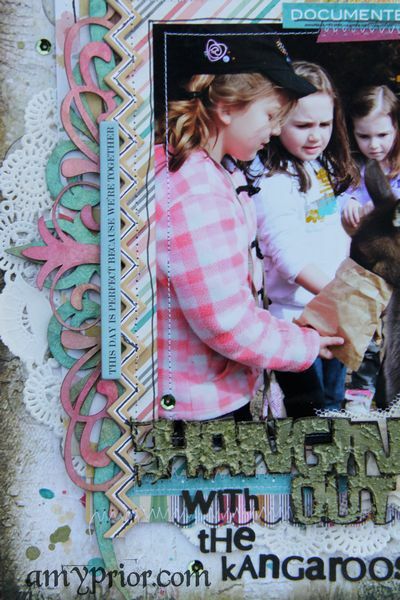 The background was given more textured layers by adding some Kaisercraft Paint mixed with Texture Paste using a Crafters Workshop Stencil. When the paint was still wet, I have sprinkled some Orange Micro Beads over the top and then splattered some random spots of Perfect Pearls Mist. Next I have used some Punchinella with Distress Ink to create the circles randomly and followed by some random stamping using my Stampin Up Background Stamp and some WOW Embossing Powder. The easiest way to create such a random embossed effect, is to stamp the entire surface using embossing adhesive, followed by pouring the powder over like normal. Before you heat set it, grab yourself a paint brush and brush away random sections of the powder including very solid blocks and lines etc. This gives a more natural feel and some of the embossing powder stuck to the micro beads which I thought was a cool effect. The Banners and Brace Shape Chipboar pieces are of course from A2Z Scraplets. The Banner has been covered with some super cute Washi Tape that I found at my local Kmart store last week. I have then added some White Pearl Strips and sprayed with Lindys Stamp Gang Fabio Spray. The Brace shape was first covered with a red patterned paper and then some orange striped washi tape was used over the top. I didn’t have much Tangerine so figured this was a good way to create it but it just turned out Orange so I went ahead and sprayed some Orange Perfect Pearls Mist over the top anyway. Gotta add that sparkle! 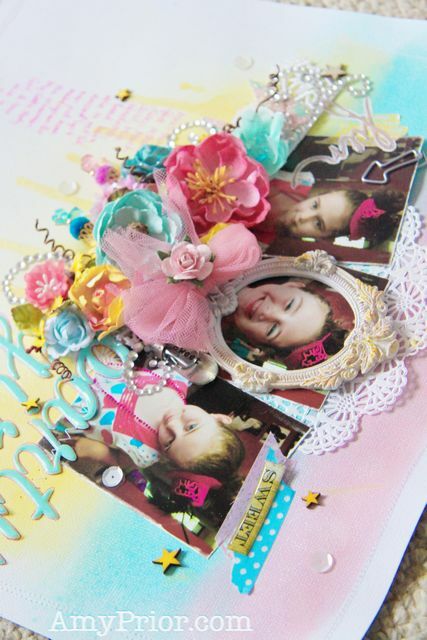 Lots of other beautiful elements to this layout including Handmade Halo Mulberry Flower that I have coloured using Lindys Stamp Gang Fabio Spray, Charms Creations Page Runner, My Minds Eye Printed Chipboard Piece as well as some Studio Calico Tags. Overall I was really happy with how this layout turned out as these colours are definately out of my comfort zone. Be sure to head on over to the Color Room website here and play along for your chance to win some fab prizes. Well that is it from me today, thanks so much for reading and don’t forget to leave me a comment so I can come visit you as well. Heidi Swapp You Rock My World! Hi everyone! I hope you are all well. 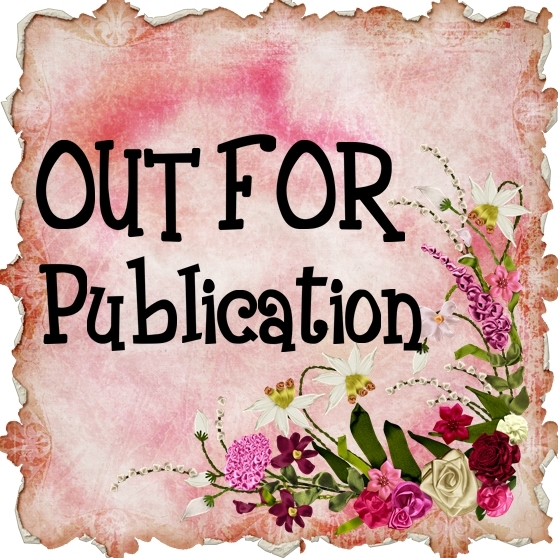 I have an exciting announcement to share on Friday eeekk so very exciting! 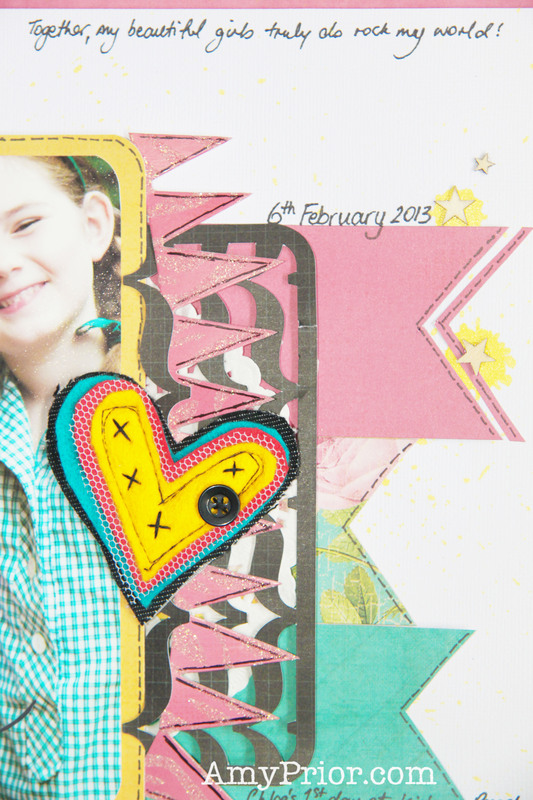 Today I wanted to share a quick layout with you all using the fabulous Heidi Swapp Sugar Chic range along with my Silhouette Cameo Machine. How cute is this photo of my girls? I know you have seen this photo a lot lately because I chose to use it a lot in Mothers Day gift making etc. Finally I get to scrap a layout for me using this fab photo and I have printed it this time 5×7 inches. It’s fun to sometimes work with really large photos but it also really easy to go over the top so I wanted to keep the layout simple with some clever layering and fabulous pops of colour. I have first trimmed my white cardstock and rounded the corners, I have then cut from the white cardstock, half of the title using my Silhouette Cameo Machine. 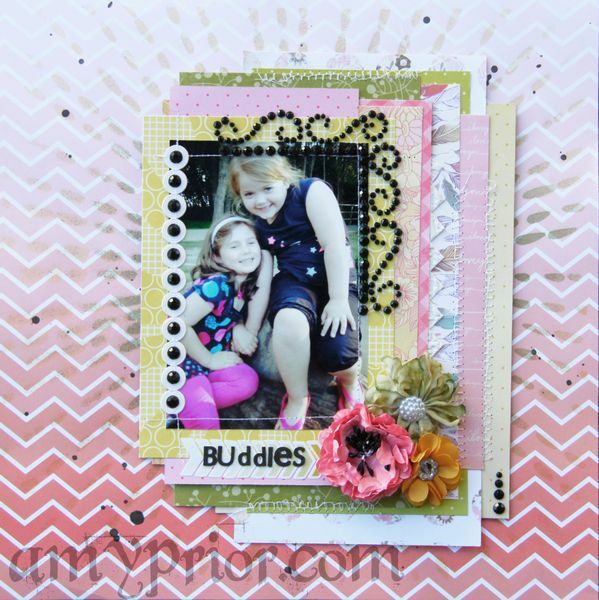 I also have cut a fabulous Wavy Chevron Design with my Cameo using the black Heidi Swapp Paper. I just cannot get enough of banners LOL. I think they are one trend that has been around forever and will never get old. Well I will always love them! Final touches were some doodling and gorgeous little Studio Calico Wood Veneer Stars. 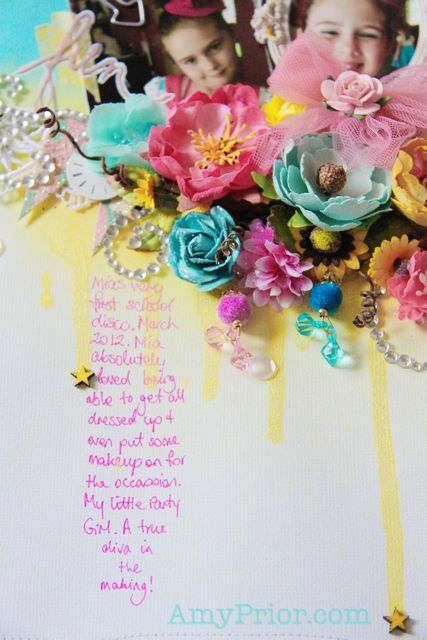 The white cardstock had splatters of Tattered Angels Yellow Chalkboard Mist and I chose to place the stars on these little bursts of colour. 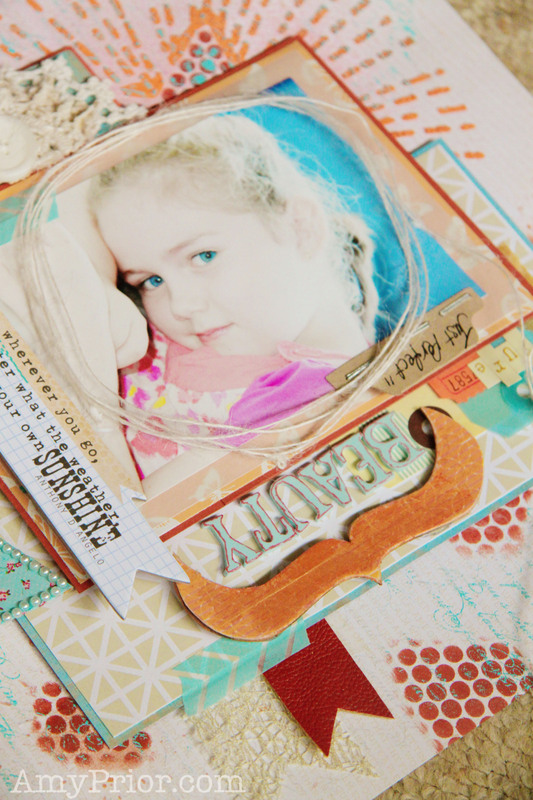 Heidi Swapp Buzz Word, Sequin Arrow along with a Charms Creations Heavenly Heart and the layout was complete. Well that is it from me today, be sure to check in on Friday with my big announcement sooo exciting.